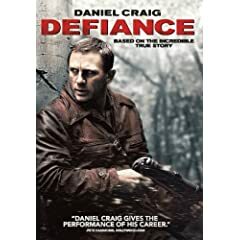 HOLLYWOOD, Calif. – Based on the extraordinary true story, the action-packed, epic tale DEFIANCE arrives on DVD and Blu-ray June 2, 2009 from Paramount Home Entertainment. Directed by Academy Award® winner Edward Zwick (Blood Diamond), Defiance stars Daniel Craig (Quantum of Solace), Liev Schreiber (X-Men Origins: Wolverine) and Jamie Bell (Flags Of Our Fathers) as brothers, simple farmers—outnumbered and outgunned—who turned a group of war refugees into powerful freedom fighters. The inspirational story of family, bravery and survival has been hailed as “gripping” (Larry King), “a must see” (Steve Oldfield, FOX TV) and “complex, engrossing and worth celebrating” (Richard Corliss, Time) and the film received Oscar® and Golden Globe® nominations for Best Original Score. Photographs taken by the director during the production. Additionally, the Blu-ray includes “Scoring Defiance”, a discussion with composer James Newton Howard and violinist Joshua Bell about the much-lauded score. below. Last date for entries is May 28, 2009.